Order cancellations may be requested by e-mailing the “Order Confirmation E-mail” you’d received from your purchse on our website back to us at: customercare@clevercatinnovations.com. Please state: “Order Cancellation” in the e-mail’s subject line, along with a brief explanation for the cancellation stated within the e-mail. Order cancellation requests received “before order has shipped” will receive 100% of the order’s cost credited back to credit/debit card within 5-7 business days from date of cancellation. Order cancelation requests received “after order has shipped” will receive the order’s cost (less shipping charges) credited back to credit/debit card within 5-7 business days from the date that cancelled item was received by Clevercat Innovations. A receipt for credited item will be provided to customer via e-mail after the order cancellation has been completed. All Clevercat® products purchased directly from our Clevercat Innovations’ website include a “30-Day Return & Exchange Policy” from the date of purchase. If you are not completely satisfied with an item purchased from our website, please e-mail the “Order Confirmation E-mail” (receipt) to: customercare@clevercatinnovations.com, and include a brief description of the return or exchange request. Returned and exchanged items are required to be shipped via prepaid-shipping, and must be received within our 30-day policy period. Exchange-items will be exchanged for identical items only. Return-items will receive a refund of the item’s purchase price (less shipping charges) credited back to credit/debit card within 5-7 business days from the date that the returned item was received by Clevercat Innovations. A receipt for credited item will be provided to customer via e-mail after the return has been completed. Notice: Items not purchased directly from our website, or items that are not compliant with our "30-Day Return & Exchange Policy" requirements as stated above will be refused for refund or exchange. Clevercat Innovations warrants Clevercat® Top-Entry Litterbox to be free of defects in materials and workmanship for a period of one-year from date of purchase. One-Year Limited-Warranty applies only to original purchaser with an original sales receipt, and does not apply to normal wear and/or damage due to abuse, misuse, neglect, or failing to properly follow cleaning instructions. The warranty-claim process requires contacting us via e-mail at: customercare@clevercatinnovations.com for a warranty-claim ID# and instructions. Warranty-claims require returning the defective Clevercat® Top-Entry Litterbox part(s) via prepaid-shipping, and must include original sales receipt, and a brief explanation of the warranty-defect. Upon our discretion, a Clevercat® Litterbox that is deemed to be defective will be replaced with new Clevercat® Litterbox part(s) at no charge. Notice: Warranty-claim litterboxes that are not compliant with our one-year warranty policy as stated above will not be honored. 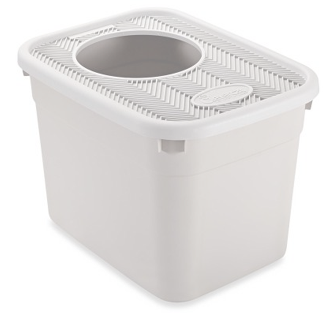 During the washing and/or drying of Litterbox parts, or during Liner changings, please prevent injury, suffocation, and/or drowning of children and/or pets by never allowing Litterbox parts and/or Liners to be left unattended, or to be positioned in any way that may harm or trap children or pets inside or underneath either item. For additional safety reasons, Clevercat Litterboxes and/or Liners are not to be used for any purpose(s) other than as a top-entry cat litterbox. Clevercat Innovations will not assume liability for accident, injury, sickness, or other adverse effects that may result from use of Clevercat® products. The consumer and/or user of these products assumes full responsibility for all risks involved. Florida Residents Only: State of Florida requires our Florida-based business to add Florida state and county sales tax to all items and shipping costs purchased on our website. We do not share or sell our customers' personal–information or their sales-data to any businesses or persons, for any reason. Liner orders: shipped via US Postal Service "Priority Mail" envelope/carton, and delivered in 3-7 business days. "Litterbox" and "Litterbox plus Liners"orders: shipped via UPS-Ground, and delivered in 3-7 business days.